Macro Assign Shortcuts for Excel (Shortcut Manager) is an Excel add-in that provides the functionality to define and add keyboard shortcuts to Excel VBA macros and menu commands. The defined assigned macro shortcuts can be set in Excel workbooks and solutions for distribution making the shortcut functionality provided by the add-in useful in Excel development and model building for wider user communities. Define keyboard shortcuts to menu items and VBA macros: assign keyboard shortcuts to existing menu items, recorded macros and macros written in the Visual Basic Editor even if they are private and don't appear in the Excel user interface. Define shortcuts to commands that aren't available directly through the Excel user interface: provide shortcut access commands that are not within the Excel menu (requiring to be added through customizing the menu) and commands that are entirely hidden and only available through VBA code. Some of these commands are active only for a certain context; therefore defined shortcuts invokes these commands during these contexts only. Create shortcuts to password protected VBA macros: invoke macros that are password protected in the VBE editor. Define shortcuts in workbook templates: workbooks created from these templates automatically inherit these shortcuts and can be used for integration of the macro assigned keyboard shortcuts into Excel development solutions for publishing and distribution. 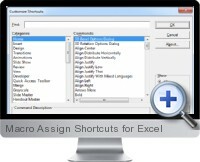 The Macro Assign Shortcuts for Excel add-in is compatible for Excel 2000 and higher.